"Bracelet of Kingdom," 2010, 29.5" by 20.5"
Above, "Bracelet of Kingdom," my entry for this year's Blogger's Quilt Festival. I completed this quilt in 2010. It measures 29.5" by 20.5" -- and uses over 100 different bits of fabric. My inspiration photo (below) is one of a series I took at the San Diego Zoo's "Hippo Encounter," using a simple point and shoot camera, back when this Mama had a little baby. The inspiration photo, taken at the San Diego Zoo's Hippo Encounter, a favorite exhibit of mine. 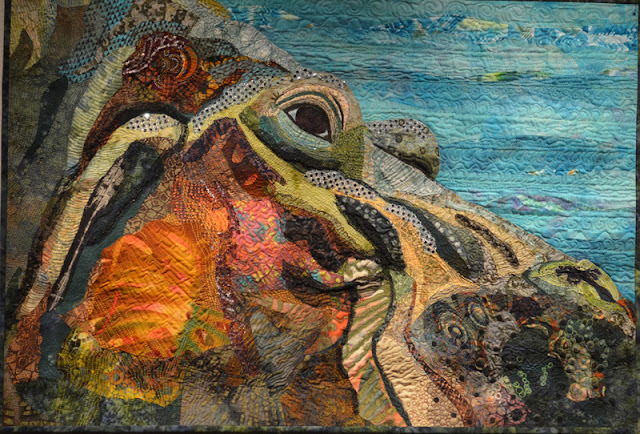 Three of these hippo photos seriously want to be art quilts. So far, this is the first. If Mama hippo looks different than most hippos you have seen, it's because she's under water and her face has become super-compressed; like when you have pressed all the air out of a plastic baggie. Also, she has no spark in her eye, as you would see in portraits of most humans and animals. That's because she has a thick film over her eye to protect it while under water -- where she can remain for over 30 minutes at a time. To get a better idea of how squished her face is, take a longer look at the photo. By the way, in my art endeavors, it's typical of me to want to represent an almost impossible photo, angle, or feeling. Typical. Inspiring the quilt's title, Bracelet of Kingdom: an African fabric. What a strange title, you might say: "Bracelet of Kingdom." 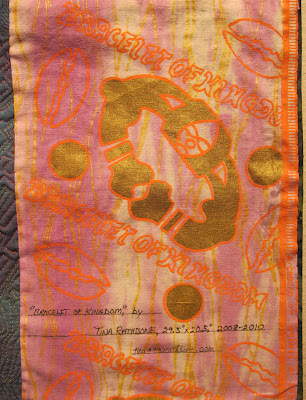 Well, this fabric showed up in my African fabric stash, with golden images of bracelets and the legend, in neon orange, "Bracelet of Kingdom." I thought of how all our lives, human and animal, are connected, as if in a round circle, like a bracelet. 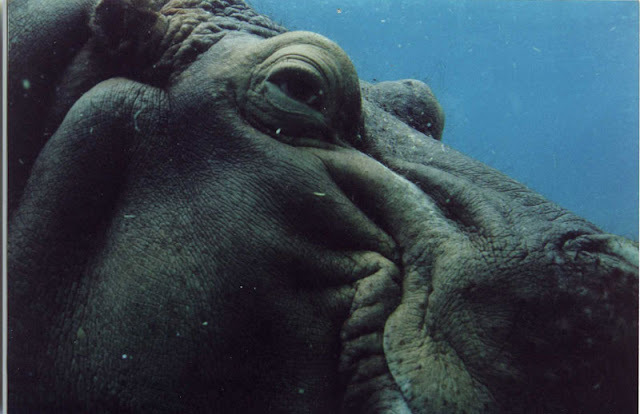 You see, the hippo kills more human beings each year than any other species on Earth (except other humans, sadly). I got a spark from that: maybe to sew the quilt's backing with the Bracelet of Kingdom fabric would send out a tiny prayer to the Earth and anyone else who is listening: Let's respect one another and other species: and make space for all species. It's our human encroachment that causes this fatal tension between hippos and humans. I know, that with kindness and just putting our heads together, we can find a way to make room for all. Techniques include fabric collage, thread painting, and machine and hand quilting. I started this quilt in a workshop with Susan Carlson at Asilomar in 2010. I designed, machine appliqued, and quilted it, using commercial and hand-dyed fabrics, including faux leather, metallics, lace and "shinies." I guess my best categories for the Blogger's Quilt Festival, Fall 2012, would be Art Quilt, Machine Applique, and Animals. Really beautiful, tina - love all the different quilting, colors - everything! What an amazing portrait. I just love looking at all the fabrics and the movement you created in the hippo's face. Lovely piece of art. Wow, this is so striking with your use of all the pattern and colors in your fabric choices. Your quilting really pulls everything together. Beautiful rendition of mama hippo. Wow. So cool! Very impressive! Holy wow! The whole thing is just incredible. your quilt is absolutely stunning - what a beautiful creation you must be thrilled with it! very inspiring. That's a great quilt! 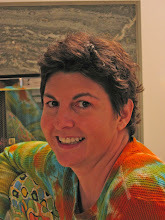 I would so love to take a class from Susan at Asilomar! I have one of her books and have always planned to do an art quilt in that style, but still haven't given it a try, but someday! Who knew hippos could look so very artful. Well done. I was really inspired by this. I have no where near hit the stage in which I can create from a photo so I love what you did. I also have a huge draw to hippos. I am so glad you shared this one. Love this so much, and reading the story of it's creation. That is one gorgeous quilt! I cast my vote...good luck! Wow, I can't imagine the talent and patience it takes to produce this kind of art! Kudos to you. Although I haven't seen the categories, I would say this is one fantastic art quilt. Since I also love to make art quilts, I find yours striking. Of course, mine would never look as good as yours, because I'm not a seamstress, only a sewer. I love your choice of design, fabrics, and colors. What an amazing piece. I'm off to vote. So impressive! Amazing fabric selection and so cleverly rendered! Thanks for your comment and vote on mine too!